I signed up for the Hyatt Credit Card earlier this year, and stayed in my first Hyatt ever when we visited Milan a couple of months ago, here is our trip report from that (I highly recommend checking out the store called Peck near the Park Hyatt, one of the most eclectic food and wine shops I have ever visited, and for me Italy in a nutshell. For that trip we transferred Chase Ultimate rewards, as the Free Night Certs took a little time to register to our account. We then found ourselves with 2 free nights to spend, and a taste for the good life from Hyatt. I created this post to find out where offered the best options for redeeming them. 2014 Updates – added Andaz Wailea and Park Hyatt New York (opens soon) and since we wrote this we have stayed at the Hyatt Carmel, my original winner, and had a fabulous time. It is worth noting that prices change not only seasonally, but also due to specific regional demand, so the prices here have limited value at times, but it does have some perspective still – you will find that the Park Hyatt Vendome is an expensive hotel, and you can see how it shapes up to competition like the Shangri-La luxury chain. I started out with a list of all of the top Category Hotels (Cat 6) – from the Hyatt website. It is worth noting that the Park Hyatt Sydney, which will be a Top 10 property, wasn’t listed on this page – so don’t overlook it! For pricing, I picked a random day – August 24th for 1 night for all properties, needless to say that depending on occupancy and other events occurring at the time of reservation that price for the individual hotel could wildly fluctuate, so take the data with a pinch of salt. 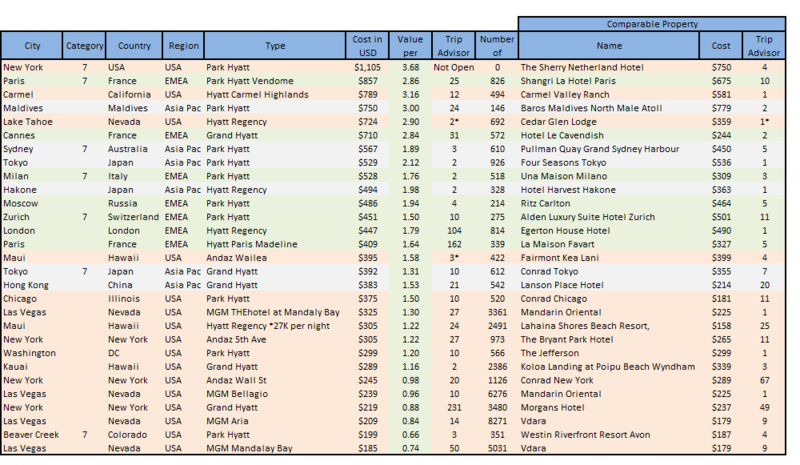 I decided to present the data in several ways, to start with, lets look at the Hyatt Gold Passport Category 6 and 7 Properties sorted by Price, with a comparable hotel (based upon a combination of Trip Advisor score, Type, Cost, and Proximity). The limitations here are that I checked only the price on the Hyatt Website, so you might be able to find cheaper, and took the lowest price on offer from Trip Advisor’s Hotel booking partners. Expect a little discrepancy, but still a good rule of thumb. When I started this list in 2013 the winner by pure expense was the Park Hyatt Vendome, which is often touted as the best value for your free nights, I have to say it is a beautiful looking property. If I was to pay full premium to stay in a swanky hotel I think that I might chose the comparable Shangri La Property for $675 per night, saving almost $200 per night for a place ranked that much higher on Tripadvisor. 2014 Update – the new leader is the yet to be completed Park Hyatt New York, this property listed nightly rates of over $1000 for basic rooms! I was surprised to see a number of USA based Hyatt’s in the Premium Category, notably the Hyatt Regency Carmel at $789 per night, beating out the Hyatt Maldives – this could be a great option for people seeking to redeem domestically since some of the aspirational properties, such as the Maldives, Paris and Tokyo might be too much of a journey for many. 2014 Update – I have since stayed in the Hyatt Regency Carmel, it is a very different experience from a category 7 Park Hyatt, the rooms are aged, and somewhat dull, but the location is fantastic, and properties in the area are generally very expensive. Another way that you might want to consider selecting your hotel would be based upon how highly ranked that hotel is by city, and if you have enough airmiles (or cold hard cash) and time to make the trip you book based on that. 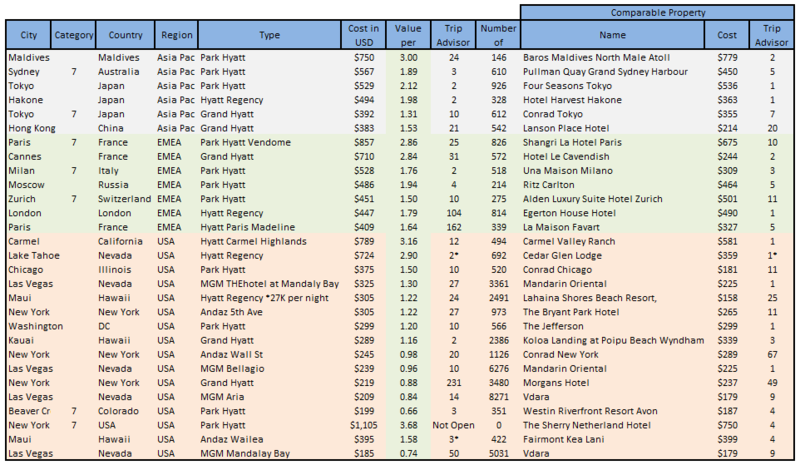 It is interesting to see how these hotels were ranked on Trip Advisor, and again I see that the data may have some limitations, in that some of the places had boutique hotels that knocked the Hyatt properties out of the water, for a similar price, but that can come down to the different expectations and parameters of a person booking on points, rather than a person booking a boutique as they would be cash payers. Also, personally I would rule out Hakone, I have stayed in the area for a weekend when living in Tokyo and I would rather repeat that trip and stay in a small Ryokan (a bed and breakfast affair) that included an out door hotspring, that you reserved by 30 minute increments so you could get naked in the snow. The three lowest performing Hyatt’s by Trip Advisor score were in major cities of London, Paris and New York. In fairness, these cities are going to be the most competitive in terms of hotel choice, and also will often fall foul of poor service, the bigger and busier a city gets the more things can go wrong. 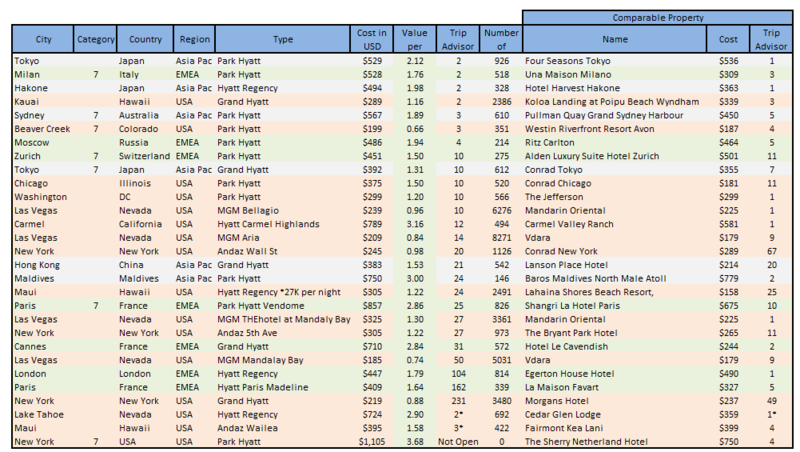 However looking at properties like Cannes I see real disparity between price and value, as I can get a room in the Hotel Le Cavendish for about 1/3rd of the cost of the Hyatt, and the former is ranked #2 hotel in the city, versus the Hyatt’s #31. 2014 Update – the new Park Hyatt in NY may well shake that up considerably. I actually opted to compare it with The Sherry Netherland Hotel, as it seems a comprable level of luxury, though it is indeed a different ‘type’ of hotel. The Park Hyatt will be modern, boutique luxury, vs old world charm. This is a good way to pick the best value based upon Location specific bookings; should you need to restrict or control the travel time, perhaps if you have limited time for vacation and are planning a shorter weekend trip. I also would like to highlight here the MGM Relationship in Vegas, a new partnership with Hyatt. Based upon TripAdvisor scores and value they performed very poorly, and all of the MGM properties had much higher ranked alternatives for lower cash cost – another example of over-inflated pricing. I know that I would much rather stay in the Mandarin Oriental (TripAdvisor #1 for $225 per night vs the Bellagio for $239). If you do decide to book one of the Comparable properties you should note that they are all high end hotels – mostly 5 Stars, and as such the majority are bookable using the Fine Hotels & Resorts (Amex Platinum Holders) and Virtuoso – both of these programs will offer room upgrades and bonuses such as $100 Spa or Dining Credits. I was surprised by the Hyatt in Carmel Highlands, as I had never considered it before – I think that it may be the place we select for our reservation (please chime in if you have stayed their with your thoughts). And also, I think the non surprising options for redemption would remain: The Maldives, Paris Vendome, Tokyo and Milan. The latter two I have stayed in already and think of very highly. Paris was high on my list purely for the cash cost, but if I am honest I am not sure that I would like to stay in Paris and don’t want to be trapped in a location just to squeeze the last dime out of the 2 Free Nights from the Chase Hyatt Card. Also, we are going to Zurich in December, and the Park Hyatt there can vary its cost up to $700+ per night, but it to me just looks like any other business like hotel in the City, so I doubt we would select it. 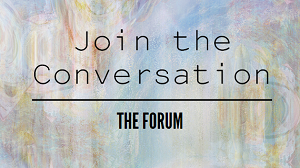 For more discussion on Hyatt Hotels, award stays and more, visit us in The Forum. We are building a community of like minded people who want to help with questions like this, and look forward to seeing you around. Good analysis, but it’s location by a long shot, unless your personal utility function puts a lot of value out of how much you save in cents per point. We have a list of cities we want to visit, and no interest in the Maldives. We might move cities up according to hotel opportunities, but we’re not sidetracking anywhere just to use points. That way lies madness. Carmel is nice; the Aquarium is fun and the coast is breezy. Skip the overpriced tourist restaurants in Monterey. I think location must be the most important too, just picking a place to go for the sake of the hotel (and its perhaps artificial cost) doesn’t make much sense. But I wanted to also highlight that if it is location most people have a few, or a bucket list and therefore you should consider which ones are value over the ‘pack’ hence including the comps. Thanks for the tips about Carmel, it looks great, but I wonder if we would be willing to fly 8hrs from NYC to the left, when going right would get us into all sorts of more trouble. Too many choices! Would be a no brainer for me if I lived on the West Coast. Great post. This is a fantastic reference guide, thanks! Thanks Jenny, glad it was helpful! Great post! I’m also having trouble figuring out where to use my nights. I have a propensity to regret a stay if I don’t get a good value out of the points/free night awards. Based out of SF and desiring to stay domestic, Carmel, Hawaii, and NYC seem like the most likely options if I have to redeem between Jan and July of 2014. Any advice on best times to visit? I’ve never been to Carmel (hence the added attraction) or Hawaii so couldn’t tell you the best times unfortunately. For NYC it is nice over the holidays, with the Window displays and giant Christmas Tree and Ice Skating. If that is too cold I would suggest May and perhaps June, as its getting warmer but not super hot yet. Agreed great post – helpful and informative. We love the Park Hyatt in DC and its an easy flight and more affordable from BDL where we live than Paris where we would love to go back to but airfare prohibitively expensive. Hi Peter, thanks very much for stopping by and sharing your thoughts, glad it helped. DC is quite close to us here in NYC so we should consider that more seriously too, but for now I am excited to get the Carmel Highlands booked this year! New Years Eve is expensive everywhere! If you have a nice trip like that in mind then for sure use up your free nights there. But to make it fair check the prices of Carmel for the same dates to consider value, I just booked this for March and the room is $739 for a random Saturday night. I’ve never stayed at that property, but I love Carmel and the coastline south of there. One place that didn’t make your cut – because it wasn’t open yet- is the Andaz Maui. This became my choice for my 2 nights after I got in on the Delta mistake fares and booked a long weekend in Maui. Enjoy. The Andaz looks great, it would certainly make my list. Hope you have a great trip! Very useful analysis. Thank you, I just applied for the card, your study will definitely help our vacation selections! Thanks so much for posting. Enjoyed your Hilton post as well. Thanks Bill, glad you liked it. We are heading to the Hyatt Carmel at the end of the month to see how the stats fare vs the reality! Thnx for the summary! 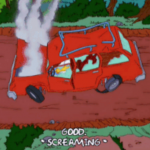 I just applied for the card and happened upon your summary. Can you provide one more tip? How did you combine your points from your Saphire card? I am unfamiliar with that type of card and am looking for a new credit card that has more bang for the buck! 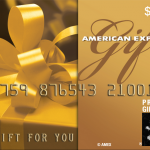 Right now, my main cards are either a Nordstrom visa (rewards r gift certificates to the store) or Citibank which let’s me accrue miles to purchase airfare on American. If you have any advice, I would appreciate it! Thanks for writing. 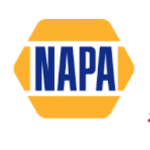 The combination occurs through the Chase Ultimate Rewards program. If you have a Chase Sapphire Preferred, a Freedom Card or Ink (business versions of their Card) you earn Ultimate Rewards. 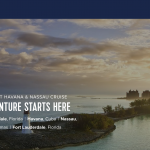 These Ultimate Reward points are transferable to Hyatt at 1:1, so what I did was earn 22,000 of them via Chase Sapphire, transfer to my Hyatt account and then book 2 free nights+1 points night for the 3 night stay. The redemption price has just changed, so the top hotels do cost a few more points, but the same idea prevails. come visit me at the hyatt Scottsdale resort Arizona!!!! Was wondering why the Hyatt Grand Aspen was left of the list. Are the 2 free nights not redeemable there? In mid ski season a studio room goes for $525/night. What award category is it? No brainer. New Park Hyatt NYC, Milan, Paris Vendome and Sydney. Andaz NYC 5th Avenue, Napa and Maui also GREAT. Can’t miss with any of these. Best “value” for the 2 free nights out of that list in my view are NYC, Paris, Milan or Sydney. Yeah – try getting a room in The PH NYC 🙂 But I think you nailed it regardless. I just stayed at the Hyatt Beaver creek. Its not so amazingly nice that I’d automatically recommend it, but if you use your nights for Sat night in Feb/March, you’ll save way more than $199, so I expect time of year is very important for some of the properties. SO Hyatt Maui Andez has skewed with this awards program. You get 2 room nights for the Hyatt credit card to use in a year. Andez says the next open date to use the room nights is Oct 2016 over a year from now.